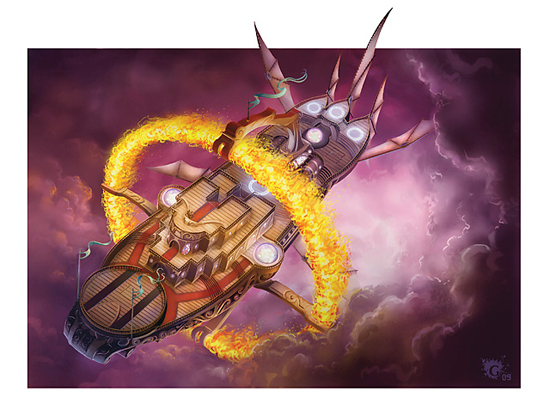 And straight back into the action we go, picking up from the mid-season cliffhanger of the elemental-powered airships plummeting out of the skies with our intrepid explorers still on-board. The immediate reaction was to head for the skiffs used by the raiders to attack the ship, which were by now trailing from the grappling hooks and cables used to secure them. Most of the adventurers were by this point on the passenger deck, dealing with the last few Emerald Claw soldiers. Some of these soldiers were looking a little unwell from their encounter with the mummy earlier, leading to some hurried debate about how contagious mummy rot might be. By necessity these were very brief discussions. One of the skiffs had been attached to the bay containing one of the ship’s ballistae, so this became the first port of call, with most of the party battling their way to it and bringing along a small handful of surviving passengers with them. Wearied from his epic feats of berserk combat last session, Koff fell into an exhausted sleep within the skiff while the crashing ships fell through the clouds. Meanwhile, the Warforged druid, Ruin secured another skiff attached to the main deck, and allowed some of the remaining Emerald Claw soldiers to board it with him. While two of them busied themselves casting off and getting clear, the others turned on him. The first one got heaved over the edge, and then close quarters combat within the small boat got bloody. There were real fears that the skiff being appropriated by the rest of the party was not going to be big enough to accomodate the passengers and those adventurers already on it. Then Keil noticed some of the surviving crewmen deliberately jumping off. Reasoning that they might have some form of token to help in the event of accidents while flying, he looked closely at some of the slain crew members and noticed that they all wore an identical rune-carved ring. Trusting to luck, he pushed the last of his colleagues free of the ship and jumped free just before they hit the plains below. The ring of featherfall that he had taken from the crew member activated just before he hit the ground, moments after the two craft crashed. Kurtis had worked out how to steer their skiff and so was able to swiftly bring their craft round to intercept the remaining Emerald Claw troops as they fought to overwhelm Ruin. The final desperate battle saw Ruin brought low, run through by the soldiers’ swords, rousing the adventurers to desperate attempts to save him. Spread across the wreckage of the two ships, the remaining cultist soldiers were defeated, while the captain of the opposing ship escaped into the distance. Pausing to gather what spoils they could from the battlefield and gaining a reward from the surviving crew, the adventurers began to debate making their way towards a fortress seen in the distance. It was a familiar sight, a place they had visited on their way to the Mournlands. It turned out to be the fortified outpost of Sterngate, where a Lightning Rail station waited. Reasoning that this was the only logical place for their quarry to have escaped to, they loaded up one of the skiffs and headed on their way.